Eliminated three times by Brazil in past World Cups, Chile vowed a fearless and fighting approach on the eve of Saturday's second round knockout game against the hosts and favorites. Despite the combative talk, 'La Rojas' are sweating on the fitness of two key players - defender Gary Medel known as "The Pitbull" and midfielder Arturo Vidal nicknamed "King Arthur" - for the showdown at Belo Horizonte's Mineirao stadium. Brazil, who will again be screamed on by legions of fans expecting nothing less than a sixth World Cup, knocked out Chile with relative ease at the same stage in their last two appearances, 2010 and 1998. They also broke Chilean hearts in 1962, beating them in the semi-finals when 'La Rojas' were hosting the tournament. "It’s not by chance that Brazil won those matches. They've won the World Cup five times. Statistically, they're the best team in the world," Chile coach Jorge Sampaoli told reporters. "But we have a chance to change history. We will play with courage as we did in the qualifiers and the group. If we don't fight against a team that has the whole stadium, the whole nation behind them, then the result will be quite clear." 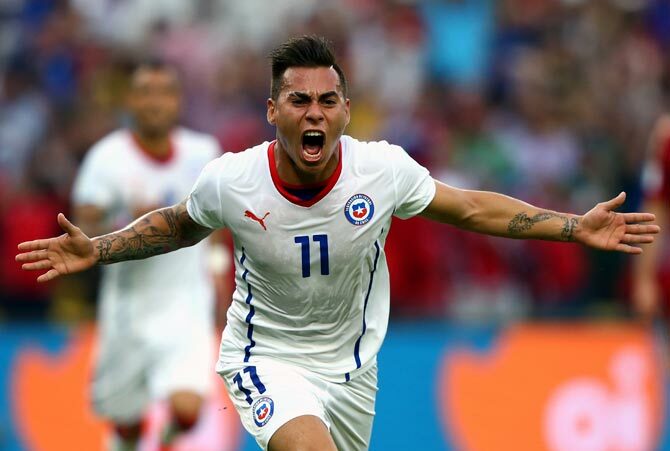 Image: Eduardo Vargas of Chile celebrates scoring his team's first goal against Spain on June 18, 2014. Chile's 2-0 defeat of reigning champions Spain sent shockwaves round the world and confirmed the strength of the South Americans' aggressive and pacy team. "Chile have improved a lot, we have developed a lot, nowadays we can play without fear. Chile will play to win. We don't want to be forgotten. Brazil already have a beautiful history, we want to make a history of our own," he said. The Argentine coach admitted Medel would not have played if the match had been on Friday due to a muscle injury in his left leg, but held out hope the defender might recover in time for Saturday's lunchtime kickoff. "Today he wouldn’t play, tomorrow maybe. Let's see if the next 24 hours allow him to play. Like Arturo, he's not 100 percent," Sampaoli said. Vidal is still suffering the effects of recent knee surgery. 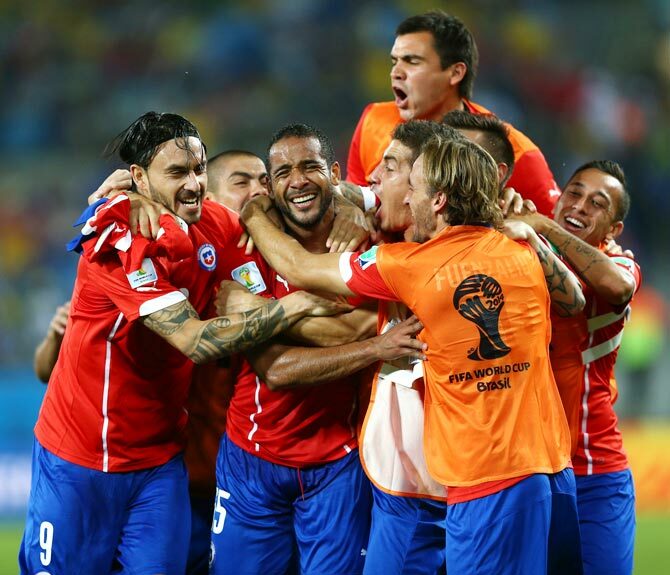 Image: Chile's players celebrate after winning their match against Australia. One of the few advantages Chile have is that their training base is just a few miles from the Mineirao stadium, so although the atmosphere will be hostile on Saturday, the city at least has felt like home over the last two weeks. Chile do not plan to man-mark Neymar, but will seek to suffocate Brazil's leading man at every turn, the coach said. At the other end, they are relying on Barcelona forward Alexis Sanchez to do the damage. Sampaoli said it was no wonder he played better for Chile than he did for the Spanish club. "Alexis feels very comfortable with the national team. He knows that he's highly appreciated by his colleagues. So that's why he's playing so well. In his club, maybe his team mates don't appreciate him so much," he said. "I think he's got enough assets to be one of the best players in the world." Defender Eugenio Mena echoed his boss's confidence, saying Chile's performances in beating both Chile and Australia at the group stage had won them respect around the world. "It's the most important match in my career. It's a beautiful opportunity for us to change history for our national team. Our team is very motivated. We're convinced we can win."